Good morning, I don't have any progress photos for you from the house yet. I should have more by Weds when I have some movement. I can tell you that the floor/base boards will be started today. Don't forget to include these babies when you are doing your own floors and planning your budget. 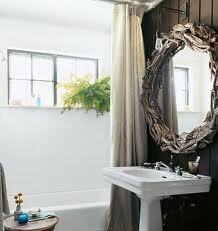 There are many styles, sizes and prices. Also, it always costs less to buy them, cut them and paint them yourself if you can. More details about those soon. In the mean time, check out this amazing living room! 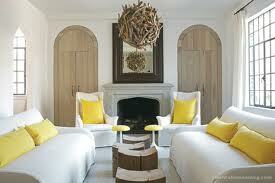 Be sure not to miss the drift wood lighting, the clean white colors, the nice wood accents like the table and doors, and those bright yellow pillows. It is a love match. What do you think? Do you have a space to share that has all of my make me happy elements? 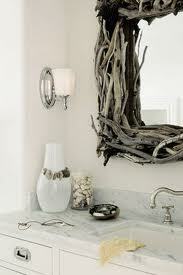 Oh, and by popular demand here is another bathroom inspiration with the driftwood mirror from Domino. 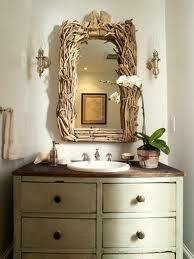 This is probably the look of the mirror I will be aiming for this week in my DIY version. I love the inspiration pics. 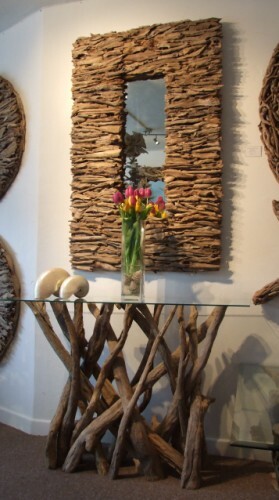 I really love to mix materials new/old, plain/fancy, I could go on and on. Hi Amy, thanks for stopping by. I love that too. It adds so much more depth and interest. I hope to show you more of my own house soon.